Representation of Mary receiving the Holy Spirit, in the presence of the angel Gabriel. Comparative theology is just what it sounds like: a dialectic between two or more religions based on their doctrinal solutions to the great problems of human existence rather than on their external forms of organisation and worship etc. The easiest way to do some comparative theology is two find two religious texts that are writing about the same thing and assess the similarities and differences. We did something very similar near the start of these sessions when we contrasted a Babylonian creation myth with the Old Testament ones. 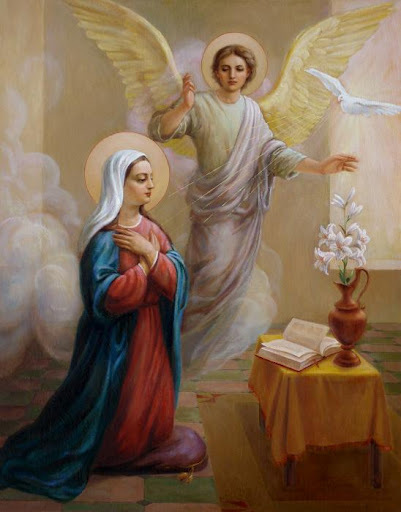 Here, near the end of these sessions, we are going to look at the Annunciation, the announcement to Mary the mother of Jesus that she is to have an important son. We are going to read a couple of pieces from the Muslim scripture (the Qur’an) alongside an account from the New Testament.